Pope Francis is backing the #RedVenice initiative in Venice, Italy, Tuesday evening (Nov. 20), that aims to draw attention to and raise public opinion on the martyrdom and persecution of Christians in many countries around the world. Vatican Secretary of State, Cardinal Pietro Parolin has sent a message on the Pope’s behalf to Patriarch Francesco Moraglia of Venice expressing his support for Tuesday evening's event in Venice called #RedVenice, sponsored by the Patriarchate of Venice, Aid to the Church in Need(ACN ), a Catholic charity helping persecuted Christians worldwide, and Venice municipality. During the #RedVenice event, numerous landmarks of the famous lagoon city, including the waters of the Grand Canal, will be bathed in red light, symbolizing the colour of the blood of persecuted Christians. “The Holy Father is sending his affectionate greetings to the young people taking part in the diocesan pilgrimage promoted by the Patriarchate of Venice and the Aid to the Church in Need foundation, to sensitize public opinion on the drama of numerous Christians persecuted for their faith,” Cardinal Parolin wrote in the message. 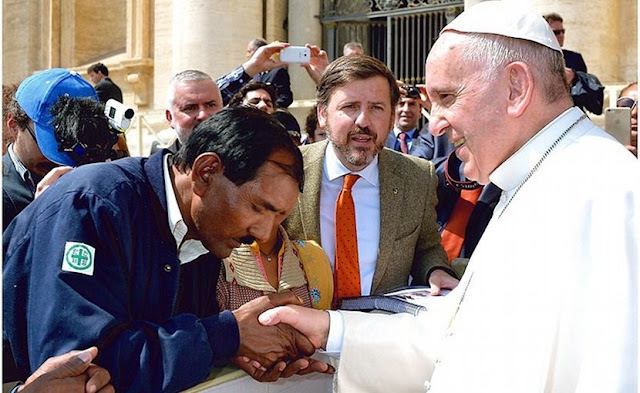 He said the Pope hopes the "provident initiative will arouse due attention on the part of all to the serious problem of discrimination that Christians suffer in many parts of the world". The message noted there are many countries where a single religion is imposed or where there is violent persecution or systematic cultural mockery of the disciples of Jesus, denying them religious freedom, which, the Pope said, is a fundamental human right that must be recognized because it reflects man’s highest dignity. Cardinal Parolin said the Pope is encouraging prayers so that Christians who find themselves in difficult conditions can prove themselves strong in the face of trials, feeling the closeness of the entire Catholic community, so they can be a seed of new vitality and hope for the Church. The Holy Father encouraged all participants in the #RedVenice initiative "to be builders of reconciliation and peace everywhere". Rome’s most famous landmark, the Colosseum, was lit up in red on February 24 this year in a similar event as a sign of solidarity with all those who are persecuted for their faith. The #RedVenice event in Venice will be focusing attention on women who suffer for their faith, especially Asia Bibi, the Pakistani Catholic woman on death row since 2010 who was acquitted of blasphemy by the country’s Supreme Court on October 31. In a video message sent to Aid to the Church in Need on the eve of #RedVenice, Asia Bibi’s daughter, Eisham Ashiq expressed her gratitude to all for their prayers and efforts for her mother. She hopes her family will be reunited finally and be able to visit Venice soon. "I want to thank all of you who continue to pray for my mother. I would also like to thank those courageous judges and the judiciary system of Pakistan who have finally recognized the innocence of my mother. My gratitude also goes out to all the governments, including Italy's, who are worried about our future and safety. We were in Rome last February when Aid to the Church in Need had the Colosseum illuminated in red. My mother was in prison at that time, but this time, when Venice will be illuminated red, she is finally free, thank God. I hope very soon that our entire family, united and finally happy and free, will be able to visit Venice. Thank you to all of you who this evening in Venice and throughout the world are praying for my mother and for all persecuted Christians."